The Camp, Woolsey and Hill Fires have devastated thousands of acres in parts of northern and southern California, and they’re still raging. To date, they’ve forced tens of thousands of people from their homes. Red Cross volunteers are there, around the clock, providing help and support at evacuation centers to offer safe refuge for those impacted by these devastating fires. Below, we’ve compiled a list of common questions and concerns that we hope you’ll share far and wide to help those living in the impacted areas. How can I prepare in case my family needs to evacuate? We’re so glad you asked. Here are some tips that can help. I’ve been told I need to evacuate. Where can I go? To find a Red Cross and community evacuation center near you, visit redcross.org/shelters or download the free Red Cross Emergency App. You can also check with your local officials and monitor your local media channels for information. Can I bring my pet with me to the evacuation center? For the well-being of our shelter residents who have pet allergies, asthma, and other health issues, there often needs to be physical space between animals and people. The only exception to this are service animals for people with disabilities because they aren’t considered pets. BUT, we don’t expect you to leave your pets at home and we don’t want you to because like you, we view pets as family members. That’s why we work with partner organizations to make sure you have a safe place for your pets to stay during disasters. These organizations make every effort to provide pet accommodations that are close to our shelters so you can visit your furry friends frequently. Here are some pet friendly lodging resources. Follow these tips to help you prepare your pets for an emergency evacuation and help them recover afterward. I’m having trouble locating my loved ones who evacuated because of the wildfires. Can you help me find them? We know how important it is to find your family and friends in an emergency. You can search for them on the Red Cross Safe and Well website. Watch this video to learn more. I’m collecting food and items for those affected by the wildfires. Can I drop them off at an evacuation center? We can’t thank you enough for your generosity, but honestly sometimes these items can do more harm than good. A photo from Texas in 2017 by Elizabeth Conley/Houston Chronicle via AP. Unfortunately, sometimes an outpouring of good intentions can become a literal mountain of stuff. Please know that our first priority is the safety and well-being of those affected by disasters. The reality is that it takes time and money to store, sort, clean and distribute donated items. These things take time and resources away from the people who need them most. 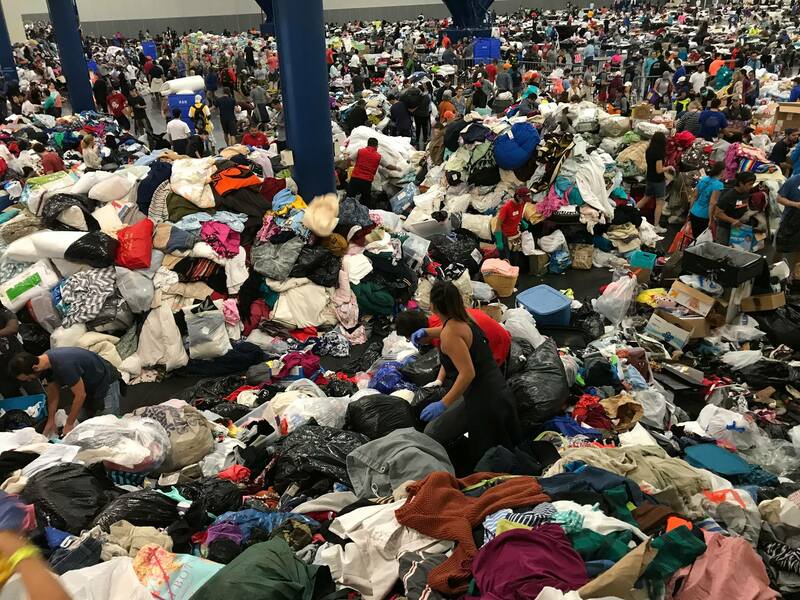 Unfortunately, some well-intentioned donations of clothing or other items may be inadvertently soiled or dirty, which can cause illness. However, we might accept large, bulk donations of new items if they fit the needs of those affected in a specific area. The best way to help during a disaster like this is with financial donations because they allow us the flexibility to give those directly impacted by the California wildfires what they need most. Financial donations can be used right away to replace items like medicines or a pair of glasses. How can I be sure the money that I donate will go directly to wildfire victims? Your generosity makes an impact, and we can’t thank you enough for your support. Trust us when we say that we honor your donor intent. An average of 91 cents of each dollar spent will go toward providing shelter, food, relief items, health and emotional support and financial assistance for those impacted by the wildfires. You can designate your donation specifically to relief efforts by choosing that option when donating on redcross.org, calling 1-800-RED CROSS or texting the word CAWILDFIRES to 90999 to make a $10 donation. Other than donating, what can I do to help wildfire victims? We’d love to have you join us and we appreciate your willingness to help. If you live near areas affected by the Hill and Woolsey Fires in California, please visit redcross.org/volunteer to learn more about Red Cross volunteer opportunities and how to submit a volunteer application. You can also find other volunteer opportunities at nvoad.org. I have been hearing on the news about the housing emergency for seniors after the fires. I live in a small town in southern Oregon and can provide a furnished room for rent at a very reasonable rate. I am a female in my 60’s and would prefer the same. Situation could be short or long term. Hi Rosemary, we appreciate your kind offer to share your home with a disaster survivor. The American Red Cross is unable to provide referrals to someone’s private home, however we do appreciate your thoughtfulness. If you live in another state can you take in a family from the wildfires that are currently homeless? Hi Sarah, we appreciate your kind offer to share your home with a disaster survivor. The American Red Cross is unable to provide referrals to someone’s private home, however we do appreciate your thoughtfulness. Hi Barbara, we appreciate your kind offer to share your home with a disaster survivor. The American Red Cross is unable to provide referrals to someone’s private home, however we do appreciate your thoughtfulness.